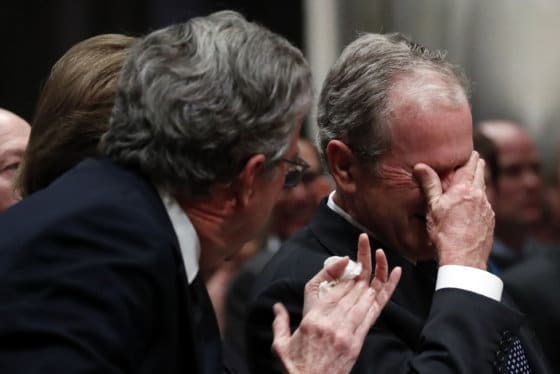 The life and public service of the nation's 41st president were celebrated with praise and humor at Washington National Cathedral on Wednesday as three former presidents looked on and a fourth — George W. Bush — prepared to eulogize his dad, the last president to fight in World War II. After three days of remembrance in the capital city, the Air Force plane with Bush’s casket left for a final service in Houston and burial Thursday at his family plot on the presidential library grounds at Texas A&M University in College Station. His final resting place is alongside Barbara Bush, his wife of 73 years, and Robin Bush, the daughter who died of leukemia at age 3. His plane, which often serves as Air Force One, arrived at Ellington Field outside Houston in late afternoon. As a motorcade subsequently carried Bush’s remains to the family church, St. Martin’s Episcopal, along a closed interstate, hundreds of people in stopped cars on the other side of the road, took pictures and shot cell phone video. One driver of a tanker truck climbed atop the hulking vehicle for a better view, and at least 15 firefighters scaled a pair of stopped firetrucks to salute. Upon its arrival at the church, Bush’s casket was met by a military band and Houston Democratic Mayor Sylvester Turner. The national funeral service at the cathedral was a tribute to a president, a patriarch and a faded political era that prized military service and public responsibility. It was laced with indirect comparisons to President Donald Trump but was not consumed by them, as speakers focused on Bush’s public life and character — with plenty of cracks about his goofy side, too. The elder Bush was “the last great-soldier statesman,” historian Jon Meacham said in his eulogy, “our shield” in dangerous times. The congregation at the cathedral, filled with foreign leaders and diplomats, Americans of high office and others touched by Bush’s life, rose for the arrival of the casket, accompanied by clergy of faiths from around the world. In their row together, Trump and former Presidents Barack Obama, Jimmy Carter and Bill Clinton stood with their spouses and all placed their hands over their hearts. Simpson regaled the congregation with stories from his years as Bush’s friend in Washington. More seriously, he recalled that when he went through a rough patch in the political game, Bush conspicuously stood by him against the advice of aides. “You would have wanted him on your side,” he said. With Trump, a bitter NAFTA critic, seated in the front row, Mulroney hailed the “largest and richest free trade area in the history of the world.” The three countries have agreed on a revised trade agreement pushed by Trump. Earlier, a military band played “Hail to the Chief” as Bush’s casket was carried down the steps of the U.S. Capitol, where he had lain in state. Family members looked on as servicemen fired off a cannon salute. Waiting for his arrival inside, Trump shook hands with Obama and former first lady Michelle Obama, who greeted him by saying “Good morning.” Trump did not shake hands with Bill and Hillary Clinton, who looked straight ahead. Bill Clinton and Mrs. Obama smiled and chatted as music played. Carter was seated silently next to Hillary Clinton in the cavernous cathedral. Obama cracked up laughing at someone’s quip. Vice President Mike Pence shook Carter’s hand. Following the cathedral service, the hearse and its long motorcade drove to the National Mall to pass by the World War II Memorial, a nod to the late president’s service as a World War II Navy pilot, then transferred his remains at Joint Base Andrews for the flight home to Texas with members of his family. Bush is set to lie in repose at St. Martin’s Episcopal Church before boarding a special funeral train to be carried to his burial Thursday. On Tuesday, soldiers, citizens in wheelchairs and long lines of others on foot wound through the Capitol Rotunda to view Bush’s casket and honor a president whose legacy included a landmark law affirming the rights of the disabled. Former Sen. Bob Dole, a compatriot in war, peace and political struggle, steadied himself out of his wheelchair and saluted his old friend and one-time rival. Former President George H.W. Bush was remembered Wednesday at an invitation-only state funeral held at the National Cathedral. See photos.